Sweet Potato (translated by Grace Jung) is a selection of stories from the career of colonial-era writer Kim Tongin (occasionally transliterated as Kim Dongin), bringing a total of fourteen pieces into English. There’s a short translator’s note in addition to a nice introduction by Youngmin Kwon, a well-known academic and translator, and the beautiful cover picture, commissioned from Korean illustrator Choi Jee-ook, rounds off an attractive physical product. Covering twenty-five years of the writer’s career, the stories address a wide range of themes and vary considerably in length and style. Even when she entertained and enjoyed her time with men, deep inside of her hid a particularly deep sigh – one couldn’t tell when this would burst. There’s no way of knowing when it began, but a certain dilemma began to grow and permeate inside her head. Is it true to live a bold but short life or a narrow and long life? These gloomy thoughts, hidden behind a beautiful and playful facade, are forebodings of the tragedy that will inevitably befall her before the end of the story. Two later stories handle similar themes, but with very different women. While the protagonist of ‘The Old Taet’angji Lady’ also trades bodily pleasure for money, her looks mean she’s far more unsuccessful, and when she takes a risk in an attempt to make some money, her life is ruined. In ‘Mother Bear’, however, a plain woman with a heart of gold and strength enough for ten men does everything right, yet is still let down by the man she marries, left almost destitute as a result of his idleness and gambling habits. I’m dying. Why? I want to live so why should I die? Who the hell is killing me?! I said I want to live, so who the hell’s trying to kill me?! Everyone dies. But I just want to live. My upbeat personality, strength, stamina – why should I die before I get to spread this all over the world?! I won’t die. What the hell is the chief talking about?! Suddenly sadness, anger – a strange feeling – pressed against my brain. ‘Dying!’ I screamed. I shut my eyes in exhaustion. It’s a slightly sombre piece describing a frightening brush with death, but Kim isn’t always as dark. ‘Like Father, Like Son’, another story told by a minor character, is a clever short piece in which a doctor describes how an inveterate skirt chaser finally settles down – and is punished for his wanton ways in a most unexpected fashion. As you may have guessed, the genius in question gets his inspiration from the darker side of life. It all starts with a fire he sets accidentally and ends in a far darker place, forcing us to wonder if the price art demands can sometimes be too high. Given Kim’s reputation, it’s no surprise that some of these stories have appeared elsewhere. ‘Flogging’ and ‘The Mad Painter’ (in different translations) are part of the free LTI Korea e-library, and the title story, in Kevin O’Rourke’s translation, appears in the Modern Korean Fiction collection. ‘Sweet Potato’ features yet another of Kim’s fallen women, one who embraces her fate and is destroyed by her decision to place money above morals, once again watched over by an indifferent lazy husband (there are a *lot* of those in Korean literature…). 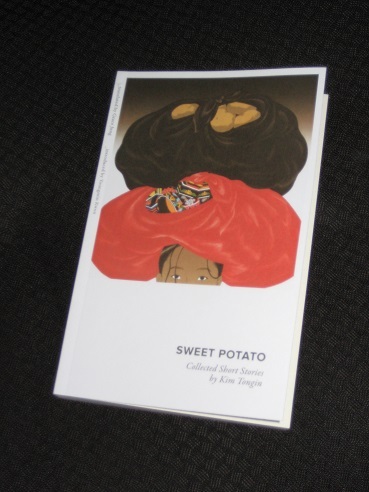 Overall, Sweet Potato is an excellent collection, with no weak pieces and several excellent stories. Combining humour, pathos, frame narratives and a host of chatty narrators, it’s a book I thoroughly enjoyed. Before I wrap the post up, I’d just like to touch on one last story, finishing on a more personal note for the writer. ‘Notes on Darkness and Loss’ describes the long, drawn-out death of the writer’s mother and is a realist autobiographical piece (with definite hints of the Japanese I-Novel). The writer is torn between caring for his mother and agonising over the money problems plaguing his family back in Seoul. It’s another time and a very different place, but this is a dilemma anyone can relate to. The story is representative of Kim’s excellent writing and just one more reason why Sweet Potato is a book you’ll enjoy even if you’re new to Korean fiction. Tony, thank you for this interesting review. Reading your thoughts to Barely Opened His Eyes brought Kawabata’s Snowland to my mind. No wonder Kim Dong-in studied in Tokyo. I’m looking forward to your next reviews. Same here. My knowledge of Korean language is very, very limited.